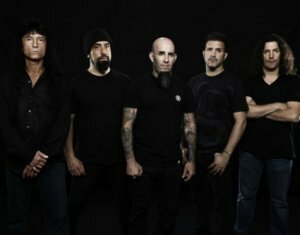 ANTHRAX recently spent time in the studio recording several cover versions of some of their favorite rock classics, to be included with the upcoming "Anthem" EP, due on March 18. "It was a lot of fun, especially because a lot of those [songs] aren't, I guess, normal for us or like so much of our repertoire — although they are because they're songs we all knew," guitarist Scott Ian tells Billboard.com. "Maybe on paper the idea of us doing something like that seems weird, until you hear them and then it makes sense. And Joey's performance on the JOURNEY song, specifically, really blows my mind. Someone mentioned that [JOURNEY guitarist] Neal Schon better not hear this or we might lose our singer." ANTHRAX also also laid down a cover version of BLACK SABBATH's "Neon Knights" for the upcoming Ronnie James Dio tribute album which is being assembled by the singer's widow and longtime manager Wendy Dio.